When I was young I love my dolls. My cousins I were rough with my dolls and I never had much clothes for them. My cousin though had lots of dolls and clothes for them made by my aunt. So when I was young I always watched her sew and do other crafts to the point I took better care of my toys. I also learn to sew and now I sew tons of projects. 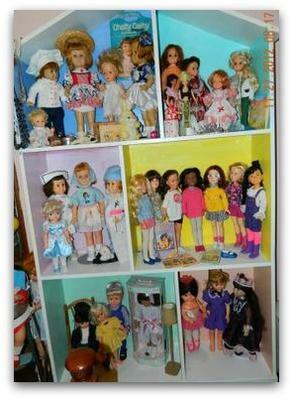 I make quilts, dresses, clothes, toys and most of all doll clothes. Your site helps others like me when I was young, to get the help they need to learn to sew. I am so happy you like the site. It is very enjoyable to post the new patterns for quilts, dolls, toys, aprons or any sewing item I think folks would enjoy. My hope is that new sewers will find a project to get them sewing. I have posted many apron patterns to make things easy for them. I remember when I began sewing, it was am apron I was taught with. 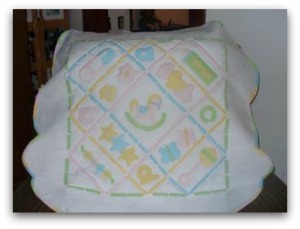 You quilt is lovely and I know a baby will surely be happy wrapped in it. Wow you do have some dolls don't you? My dolls have all been passed to the grandchildren long ago. I hope you visit often as I am putting up new patterns and ebooks every week as I get them ready. Thank you so much for the kind words about my site and the encouragement for the new sewers. Blessings to you and thanks for sharing your story. Join in and write your own page! It's easy to do. How? Simply click here to return to Sewing and Sharing.